Early intervention psychological services aim to increase overall community access to evidence based psychological interventions for people with, or at risk of, mild mental health illness, and improve outcomes for this population as a whole. with moderate to severe mental health conditions at risk of relapse who can make use of low intensity services to build resilience. 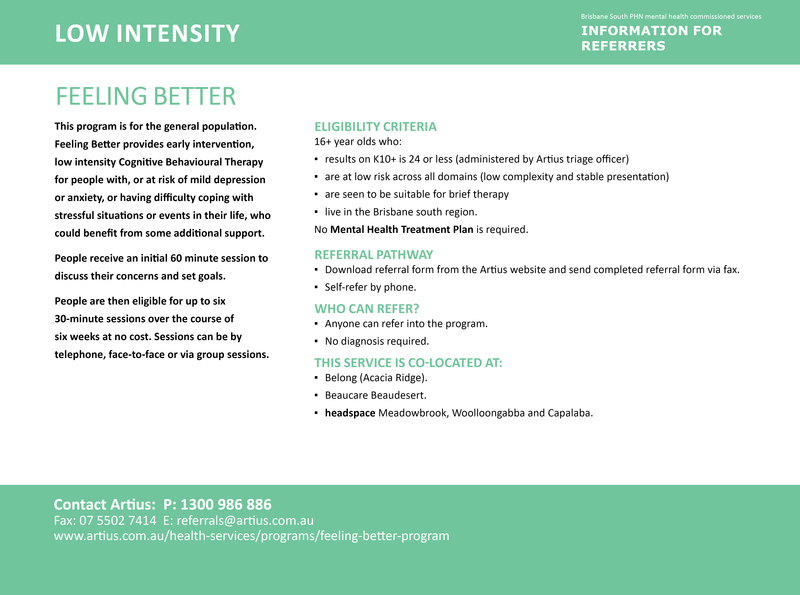 Early intervention psychological services are delivered across a mix of modalities including phone, online, group sessions and face-to-face, by a diverse workforce made up of vocationally qualified mental health workers, consumer and carer peer workers and tertiary trained clinicians. 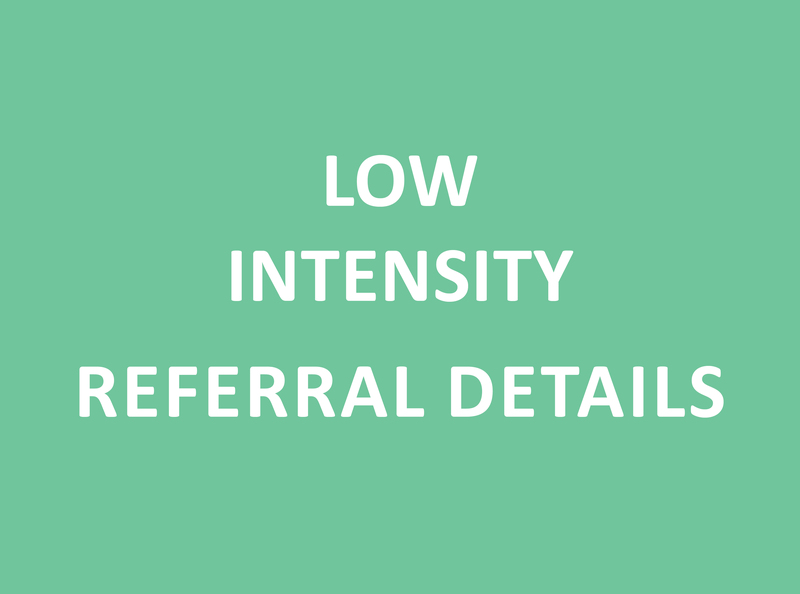 Referrals can be made by all members of the community by contacting the Service Providers directly. Artius has a wealth of experience in the delivery of mental health services across South East Queensland and aim to help people, businesses and communities to reach their potential. Artius offer a wide range of services from physiotherapy, psychology, employee assistance programs, manual handling courses, job search support, resume development, vocational training and much more. Artius is commissioned by Brisbane South PHN to deliver low intensity psychological services across the whole region for the wider community. The Feeling Better Program designed for people aged 16 years and over and offers residents who live in the Brisbane South region six weekly, 30-minute sessions at no cost. This evidence-based program is provided across a mix of modalities including telephone and email support, peer training and education, online forums, digital resources, group sessions, one-on-one sessions, eHealth interventions and video-conferencing depending on the needs of the individual. Established in 1989, Belong (formerly known as Acacia Ridge Community Support Inc.) is a not-for-profit community-based organisation that provides services and support to families, individuals and communities in a safe and respectful environment, delivering a range of programs and services in response to identified local needs and aspirations. 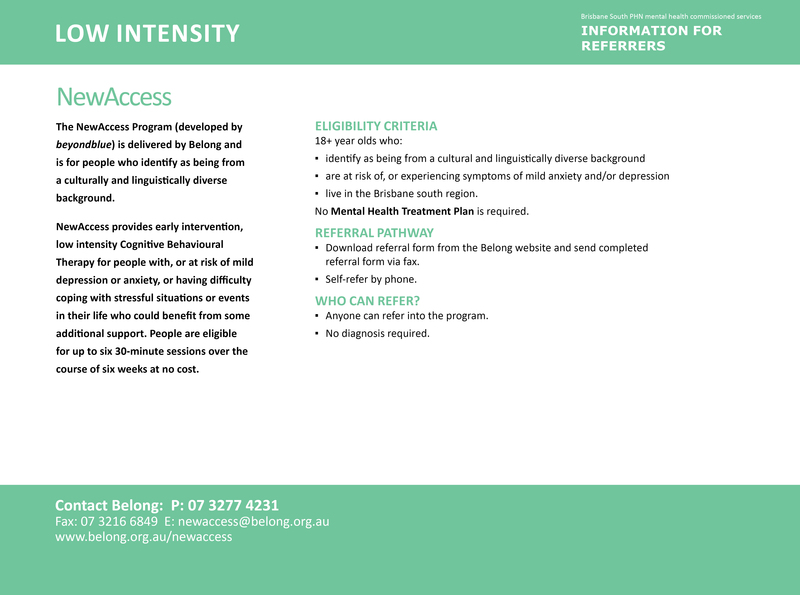 Belong is commissioned by Brisbane South PHN to deliver the beyondblue’s NewAccess program supporting people from the culturally and linguistically diverse community experiencing mild to moderate depression or anxiety through low intensity cognitive-behavioural therapy. The program model involves 6 free sessions with a NewAccess Coach, either face-to-face, over the phone or via telehealth.